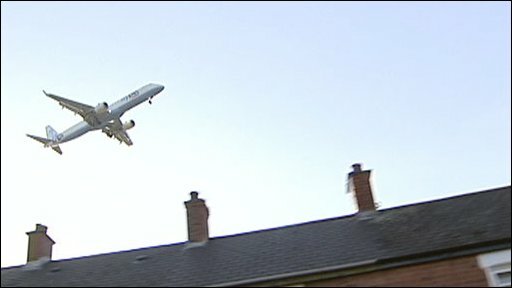 An investigation is under way after people living near George Best Belfast City Airport claimed a low-flying jet smashed roof tiles on a house. 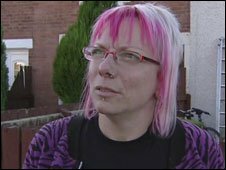 Katrin Irvine who lives at Parkgate Crescent directly beneath the flight path said she heard a "big bang" at about 1300 BST on Sunday. About 30 tiles had come off her roof and landed in several gardens, she said. A spokesman for the airport said that they would investigate the report. "All aircraft approaching the airfield do so in accordance with strict Civil Aviation Authority regulations," he added. The Civil Aviation Authority confirmed that it had not yet received a report of the incident from either the airport or the airline but a CAA press officer said that aviation organisations are allowed four days to file such a report. Mrs Irvine said that it was lucky her six-year-old daughter Caitlin had been playing in someone else's garden when the roof slates fell. "I looked out the back and thought the kids might have broken something in the back yard... then I came out and saw all my neighbours running out of their houses and looking at my house," she said. "Then I noticed that loads of tiles had come off my roof and landed across three gardens. "Some of the neighbours told me a plane had come over and it looked like some kind of backdraft had taken off part of my roof." East Belfast assembly member Sir Reg Empey said there should be no expansion of the City Airport following the incident. Sir Reg said someone could have been killed and the airport should not expand any further. "I think there has to be a balance between the local residents and the airport," he said. "Continued expansion, in my view, is incompatible with that balance being maintained. I do think it has got to stay more or less where it is and stop expanding."